COLORADO SPRINGS, Colo. — While a news crew reported live from the scene of a fatal shooting Tuesday morning, a driver plowed into the crime scene. 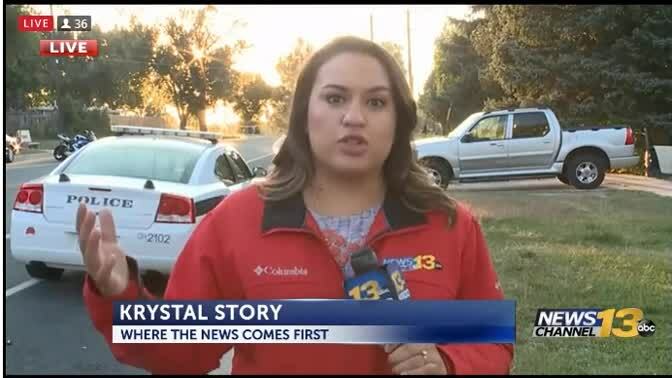 A 6 a.m., a KRDO crew out of Colorado Springs was reporting from the scene when an “erratic driver” hit their news car and then drove into the crime scene, KRDO reported. Both KRDO reporter Krystal Story and photographer Pete Miller are OK. Story said the car missed them by inches and the side mirror of the SUV hit Miller. KRDO reported that the driver was arrested. At 8:44 p.m. Monday, the Colorado Springs Police Department responded to the 1300 block of E. Las Animas Street after receiving a report of shots fired in the area. Officers found a man in the street next to a motorcycle with an apparent gunshot wound. He was conscious and taken to a local hospital, where he died. Police said the death is suspicious and there is no suspect information. Anyone with information on the shooting is asked to call the Colorado Springs Police Department at 719-444-7000. Those who wish to remain anonymous can call Crime Stoppers Tip Line at 719-634-7867 or 1-800-222-8477.